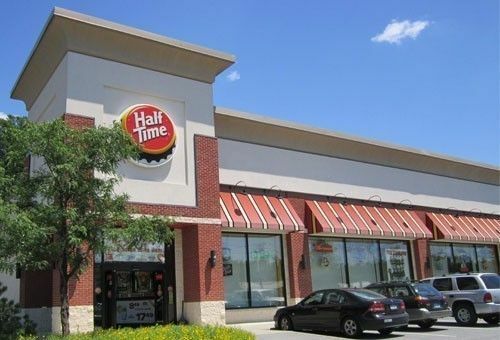 Half Time is conveniently located on Route 9 (aka South Road) in Dutchess County and easily accessible via main highways. From New Jersey, make your way onto route 87 North to route 84 East to exit 12 onto route 9 North. Half Time is 10 miles north on the right. From New York City, make your way upstate via several of the highways and state roads such as Interstate 95 or The Taconic State Parkway. Once on Interstate 84, head West to exit 12 onto route 9 North. Half Time is 10 miles north on the right. The ride is about 90 minutes. From Newburgh, hop on Interstate 84 East to exit 12 onto route 9 North. Half Time is 10 miles north on the right. From Rockland County, hop on Interstate 87 to route 84 East to exit 12 onto route 9 North. Half Time is 10 miles north on the right. From Connecticut, hop on Interstate 84 heading West to exit 12 onto route 9 North. Half Time is 10 miles north on the right. We are approximately 45 minutes from Danbury. Wherever you are traveling from we promise to make your trip worthwhile. Half Time in Mamaroneck is conveniently located on Hoyt Avenue in Westchester County and easily accessible via main highways and by train. From Boston Post Road, make your way to Mamaroneck Avenue, head west toward the Mamaroneck Train Station, once past the train’s overpass, make a left onto Hoyt Avenue. From New York City, make your way to I95 and take the Fenimore Rd exit (18A), turn right onto Fenimore Rd, turn left onto Hoyt Ave.
From Connecticut, take I95 to the Mamaroneck Exit (18AB) and follow signs for Mamaroneck Ave east. Before the Mamaroneck Train overpass, turn right onto Hoyt Ave.
From New Jersey, make your way to I95 and take the Fenimore Rd exit (18A), turn right onto Fenimore Ave, turn left onto Hoyt Ave.
From Connecticut (13 miles) -Head south on I-95 S toward N.Y. City. Take exit 18A-18B for Mamaroneck Avenue toward Mamaroneck/White Plains. Take exit 18A for Fenimore Road East toward Mamaroneck. Merge onto Mamaroneck Avenue. Turn right onto Hoyt Avenue. Half Time will be on the right. From George Washington Bridge (18 miles) - Head east on I-95 Upper Level N toward Exit 1. Continue onto I-95 N. Merge onto I-95 N. Take exit 18A for Fenimore Road. Turn right onto Fenimore Road. Turn left onto Hoyt Avenue. 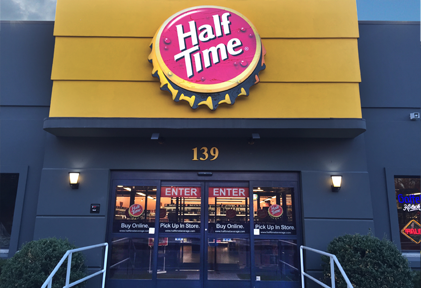 Half Time will be on the left. From Tappan Zee Bridge (20 miles) - Head west on I-287 W/I-87 N. Take exit 10 to merge onto US-9W N. Take the Interstate 87 S/New York Thruway S ramp on the left to Interstate 287 E/NY City. Merge onto I-287 E. Take exit 8W for Bloomingdale Road. Turn left onto Bloomingdale Road. Slight left to stay on Bloomingdale Road. Turn right to stay on Bloomingdale Road. Turn left onto Mamaroneck Avenue. Turn right onto Hoyt Avenue Half Time will be on the right.